Restoration of lakes and reservoirs with extensive cyanobacterial water bloom often requires evaluation of the sediment quality. Next to the chemical analysis of known pollutants, sediment bioassays should be employed to assess toxicity of the present contaminants and to make predictions of associated risk. Brno reservoir in the Czech Republic is a typical example of water bodies with long-term problems concerning cyanobacterial water blooms. 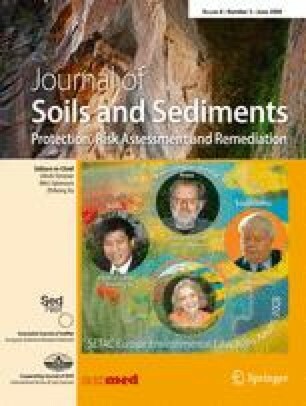 Comprehensive assessment of reservoir sediment quality was conducted since successful reservoir restoration might require sediment removal. An important part of this survey focused on an examination of the utility of Tubifex tubifex and its sublethal biochemical markers for the assessment of direct sediment toxicity. This complex study included chemical analysis of contaminants (heavy metals, organic pollutants), ecotoxicity testing of sediment elutriates (tests with Daphnia magna, Pseudomonas putida, Sinapis alba, Scenedesmus subspicatus), and other parameters. We have tested in more detail the applicability of T. tubifex as a test organism for direct evaluation of contact sediment toxicity. Survival tests after 14 days of exposure were complemented by an assessment of parameters serving as biomarkers for sublethal effects [such as total glutathione content (GSH), activities of the enzymes glutathione transferase (GST), glutathione peroxidase (GPx), and glutathione reductase (GR)]. The data matrix was subjected to multivariate analysis to interpret relationships between different parameters and possible differences among locations. The multivariate statistical techniques helped to clearly identify the more contaminated upstream sites and separate them from the less contaminated and reference samples. The data document closer relationships of the detected sediment contamination with results of direct sediment exposure in the T. tubifex test regarding mortality but namely regarding the sublethal endpoints rather than the results obtained with other test organisms exposed to sediment elutriates. Aside from the reduction in T. tubifex survival, the sediments with organic pollution caused an increase in glutathione content and increased activities of glutathione S-transferase and glutathione peroxidase in the exposed T. tubifex worms. Results of our study confirm the suitability of T. tubifex for toxicity testing of raw waters and sediments. This longer-lasting direct contact test has proven more sensitive and appropriate to reflect a lower level of pollution than do the elutriate tests. Sensitive biochemical changes in T. tubifex, including an elevation in GSH levels and GST activities, reflect a general stimulation of detoxification metabolisms in the presence of xenobiotics. The results also suggest an important role of glutathione and related enzymes in detoxification processes and possible involvement of oxidative stress in toxicity mechanisms in benthic sediment-dwelling worms such as T. tubifex. The complex assessment has identified the more contaminated samples with locally increased concentration of organic pollutants and significant ecotoxicity. The direct sediment contact test with T. tubifex and especially the biochemical parameters corresponded better to the lower level of pollution than the other tests with sediment elutriates. Despite its greater time and cost demands, the direct sediment contact test can provide a more realistic picture of exposure. Sediment bioassays should always be included as an integral part of the sediment quality assessment. The direct contact tests also take into account the more hydrophobic pollutants that are not easily available for the water elution but can still be accessible to the organisms. The T. tubifex test is a suitable option for contact sediment toxicity tests also because these animals show measurable sublethal biochemical changes that can be associated with this exposure. Research was supported by project ‘AVOZ60050516’ granted to the Institute of Botany and EC project ECODIS (FP6 No. 518043-1).